Articles Tagged "James A. Marusek"
Each morning, I turn on my computer and check to see how the sun is doing. For the past several years I was normally greeted with the message "The sun is blank - no sunspots." We are at the verge of the next sunspot cycle, Solar Cycle 24. How intense will this cycle be? Why is this question important? Because there are “Danger Signposts” ahead! Sunspots are dark spots that appear on the surface of the sun. They are the location of intense magnetic activity and they are the sites of very violent explosions that produce solar storms. The sun goes through a cycle lasting approximately 11 years. It starts at a solar minimum when there are very few sunspots and builds to a solar maximum when hundreds of sunspots are present on the surface of the sun and then returns back to a solar quiet minimum. This cycle is called a solar cycle. We are currently in a solar minimum leading up to Solar Cycle 24, so named because it is the 24th consecutive cycle that astronomers have observed and listed. The first cycle began in March 1755. Mankind has been down this road before and we will go down this road again and we will survive. The last time we faced this type of disaster was over 300 years ago, as a result it has almost been erased from our collective memory. A solar “Grand Minima” produces a time of great hardship, a time of significant natural global cooling, a time of great famine and starvation and a time of major epidemics. 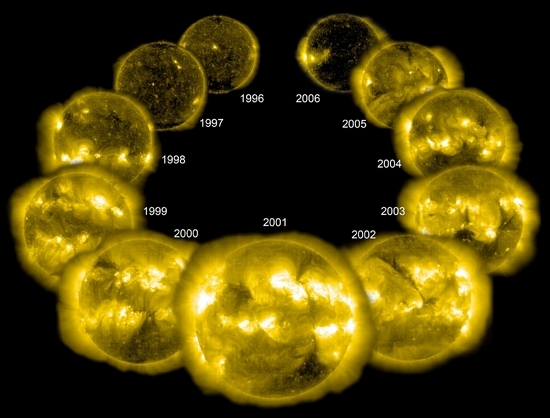 The sun exhibits great variability in the strength of each solar cycle. This variability ranges from extremely quiet “Grand Minima” such as the Maunder Minimum (1645-1715 A.D.) to a very active “Grand Maxima” such as the enhanced activity observed during most of the 20th century (1940-2000 A.D.). A solar Grand Minima is defined as a period when the (smoothed) sunspot number is less than 15 during at least two consecutive decades. The sun spends about 17 percent of the time in a Grand Minima state. In the past, these periods caused great hardship to humanity and significant loss of life. Solar Grand Minima events correspond to periods of dramatic natural global cooling. The Maunder Minimum (about 1645-1715 A.D.) and Spörer Minimum (about 1420 to 1570 A.D.) are two examples of recent “Grand Minima” events and each period has been referred to as a Little Ice Age.